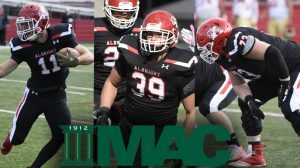 ANNVILLE, Pa. – Three senior Albright Lions football members earned All-MAC honors as voted on by the leagues head coaches that announced by the league on Tuesday morning. Wide receiver Kyle Dickerson and defensive lineman David Sanchez earned first team honors, while offensive lineman Kyle Ryan earned second team honors. Dickerson earned his fourth career All-MAC honor and his second at wide receiver in his final season at Albright. He set career-highs with 1,063 receiving yards on 81 receptions and 13 touchdowns that ranked him second in the conference in each category. He finished the season by scoring touchdowns in six-straight games and tallied 100-yard receiving outputs in six games as well for the season. He became the fifth wide receiver in program history to reach 1,000 yards for the season and will finish with 4,027 all-purpose yards. Against FDU-Florham, Dickerson posted 199 yards receiving on 14 catches and caught three touchdowns. The 14 receptions were the most in a game for a Lions player since 2015 and he also ran for one touchdown as well to become the eighth Lions player to score four or more touchdowns in a game. Sanchez earned All-MAC honors for the third straight season on the defensive line and earns his first ever first-team selection. He ranked fifth on the team with 53 tackles and tied for second with 8.5 TFL. 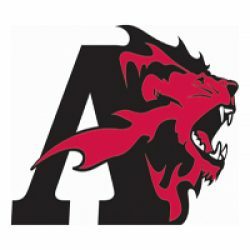 Sanchez ranked third in the MAC with four forced fumbles to give him six for his Lions career and tied for the team lead with two fumble recoveries. He matched his career-high in tackles with 12 versus Misericordia and blocked two kicks on the season as well. Ryan earned All-MAC honors on the offensive line for the first time in his collegiate career. The senior started at left tackle in every game this season, and will close his Albright career by starting in 21 straight games. Ryan also became the first Lions offensive lineman to earn team Pretzel Bowl MVP honors against Stevenson back in September.